Whether you spy a handful of the world’s largest yachts in your cruising travels or “just” a bunch of 100-odd-footers, chances are they were built by one of the yards listed here. From Maine to Monaco and even China to New Zealand, there’s a yard skilled at building these magnificent machines. We’ve compiled their contact information along with details about current and future projects 80 feet or longer. We’ve also included abbreviations for the hull materials that these dreams are made of: A for aluminum; S for steel; F for fiberglass; and W for wood. A 34-meter (111-foot) classic-style motoryacht and a 32-meter (105-foot) motoryacht, both with steel hulls, are under construction. While the yard doesn’t have any motoryachts under construction, it is building a 94-foot motorsailer for a winter 2007/2008 delivery. Construction: F U.S. offices: Surfside 3 Marina, Huntington, NY. Skipper Marine Holding, Winthrop Harbor, IL. Allied Marine Group, Miami, FL. Waypoint Yachts, San Diego, CA. The yard continues to build and deliver a number of its Flybridge 85 and 105 offerings. This Queensland-based yard delivered a fully custom 100-footer to an Aussie owner earlier this summer. She’s designed to look like she stepped out of the early 20th century. A 30-meter and a 34-meter (98- and 112-footer, respectively) were delivered this year. A 174-footer should be completed soon as well. 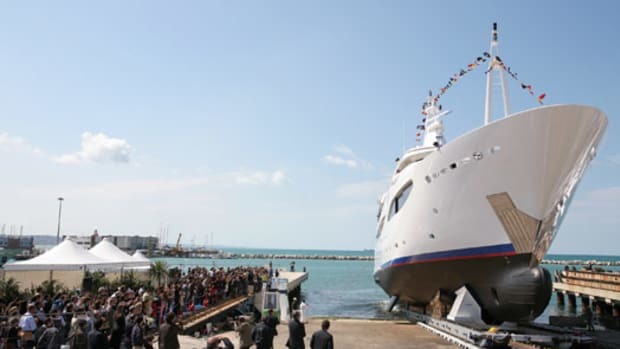 In May Benetti held a christening ceremony for Sunday, a blue-hulled 190-footer featuring design cues from the famed ocean liner Normandy. It’s also readying several offerings in its Tradition, Vision, and Classic series yachts for delivery. 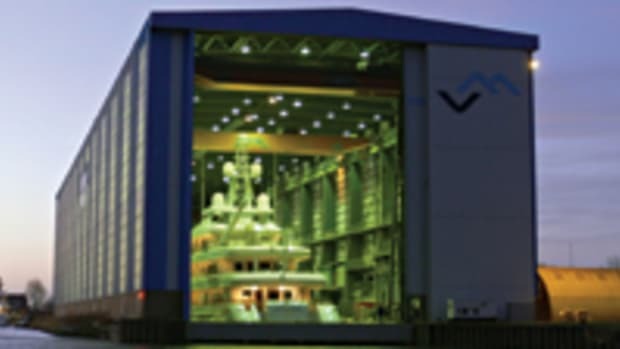 In addition, the yard’s collaboration with the Fincantieri shipyard recently resulted in a signed contract for a 130-meter (426-footer) scheduled for delivery in 2010. Capturing the spirit of a bygone era, the yard recently delivered the 90-foot Griffoen, featuring a classic canoe stern. The yard did not reply to our request for information by presstime, though it does have a few confidential projects underway. Expect to see a 120-footer with an on-deck master debut at the Fort Lauderdale International Boat Show this year. A same-size yacht with walkaround decks should be ready early next year. Burger delivered its largest project to date this summer, the 144-foot Mirgab V, for a Kuwaiti owner. Among her noteworthy features: side-deck bulwarks that fold down into a veranda. Next up is Time for Us, a 154-footer, for an American couple. This latter project marks the largest yacht built to date.